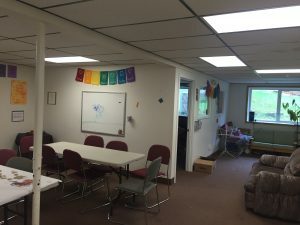 UUFF makes its sanctuary, foyer, kitchen and classrooms available by reservation on Saturdays; Sundays after 2 pm; and weekdays. Events and activities sponsored by UUFF have priority for building use. 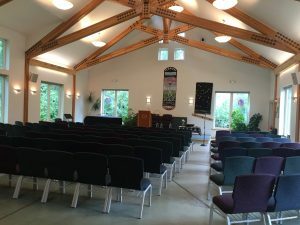 The sanctuary can seat approximately 115 people comfortably with a maximum of 150. 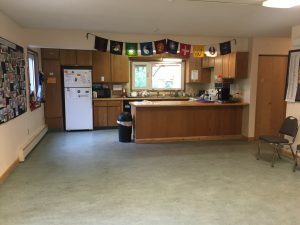 The sanctuary, foyer, kitchen and one bathroom are all handicapped accessible. The sanctuary includes a Steinway piano, which is available for use by trained musicians only. Conditional use of the built-in sound system is also available for an extra fee. Rental policies and rates are included in the documents linked to below. Building rental decisions will be made by the UUFF Board and the Building Use Coordinator in accordance with general UU principles, and with the UUFF’s own traditions of open-mindedness and religious tolerance. Please note that rental rates have changed as of 7-1-2017. If you have any questions, please just ask us. Thanks. 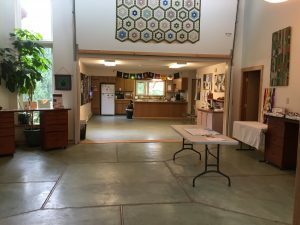 UUFF members who would like to reserve the sanctuary or other building space for meetings or other events are requested to complete the UUFF Rental Form. Please check with the Office Manager before scheduling any meetings or events to assure availability. 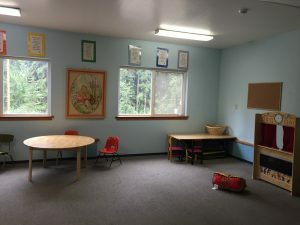 If you have questions about building rental or building use, please contact us or leave a message at 907-451-8838 with your name, phone number and a good time to return your call.